As I write this, Teddy is sitting next to me working on a new, improved version of the translation tool! I believe we've mentioned this a few times before in various places, but haven't gone into detail.. So, the new translation tool will have full Steam Workshop support, which means it'll be easier to create and manage translations - no more zipping and uploading through the forums, wohoo! It'll also be a lot easier to find translations, as it'll be done directly through the game client (and thanks to Steam Workshop, any updates made to the translations will be downloaded automatically). Basically, the red squares are placeholders for the icons used by the translation. 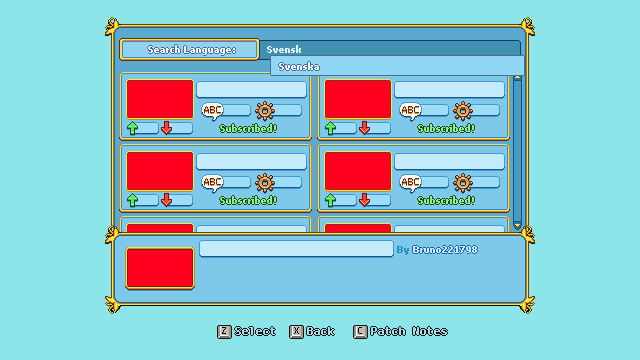 The white boxes to the right of the squares are where the translation's title will be displayed, and the "Subscribed" text will only appear on translations you've subscribed to (duh), which means they'll be added next to your English (Default) selection in the game's Options. Beneath the icons are green and red arrows. These indicate how many upvotes vs downvotes each translation has gotten. The speech bubble-icon will indicate what percentage of the dialogue has been translated, while the cogwheel next to it will tell you the completion percentage of system texts (interface/menu stuff mostly). We figured we'd separate these as many feel that the dialogues are more important than interface stuff, and having a single % would be misleading in cases where 100% of the dialogue has been translated but 0% of the interface, bringing the overall completion unfairly low. Since we realize these icons may be a bit unclear on their own, we'll add a description beneath the content box, explaining what the icons mean. Finally, you'll be able to use search box to filter the translations based on your language, and it'll suggest languages based on what you've written already!